Typically when new photographers sharpen their photographs they will apply sharpening globally to the entire image. But there are times when you need to apply the sharpening more selectively. One technique that uses this approach is edge sharpening where the sharpening is restricted to just the edges in the image. This can be perfect for some subjects as the edges are enhanced without affecting areas of continuous tone such as the sky. This tutorial explains how you can enhance your photographs by applying edge sharpening in Photoshop. This image is typical of the type of image that benefits from edge sharpening. It contains lots of edges that need to be enhanced in order to define the details. At the same time we don’t want to affect the appearance of the stone between the edges. If your layers window isn’t visible, open it by selecting “Window | Layers” from the Photoshop menu. Alternatively you can use the keyboard short cut F7. Duplicate the image to a new layer called “Edge Sharpening”. You can do this be selecting “Layers | New Layer | Layer from Background…” from the Photoshop menu. Alternatively you can use the keyboard shortcut Ctrl + J (Command + J on the Mac). Then duplicate the layer again but call this next Layer “Edge Mask”. 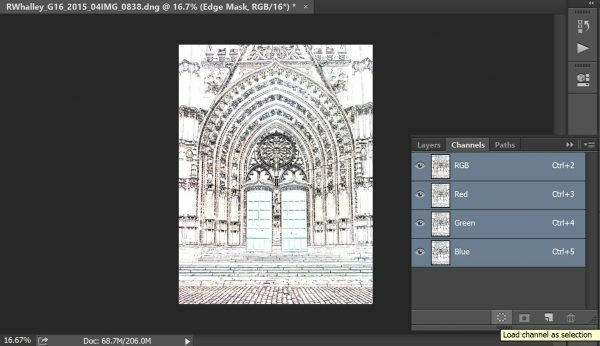 Your Layers window in Photoshop should then appear similar to the screen shot below. In the Layers window select the Edge Mask layer by clicking on it. Next apply the “Find Edges” filter by selecting “Filters | Stylize | Find Edges” from the Photoshop menu. Once processed your image should take on the appearance of a line drawing similar to that shown below. If you zoom in to examine the detail of the image you will see something similar to the image below. Notice that whilst the edges have been selected, there is also some fine detail that has been selected that we might not want. In this next step we will strengthen the bold lines whilst removing the finer lines. This is done by applying a Levels adjustment to the Edge Mask layer. Be sure to zoom in to 100% whilst you make the adjustment as this makes it easier to judge. From the Photoshop menu select “Image | Adjustments | Levels…” which causes the Levels dialog to be displayed. Move the black point and white point levels inward from each end as shown in the screen shot below. As you do this you will notice the mask image is adjusted to pick out the main lines. You can see the result below. Now repeat the Levels adjustment followed by the Gaussian Blur filter. This helps to widen and emphasise the lines further. Your finished image should then feature only bold lines as shown below. Switch to the Channels view of the image (“Windows | Channels” in the menu) and click the “Load channel as selection” icon. You can see this in the screenshot below. The icon appears as a circle with a dotted outline. Return to the Layers window and click the Edge Sharpening layer before clicking on the “Add layer mask” icon. You can see this below. Once the new Layer Mask has been added press Ctrl + I (Command + I on the Mac) before doing anything else. This keyboard shortcut will invert the mask so that black becomes white and white becomes black. You should also click on the eye icon to the left of the “Edge Mask” layer to hide it. Your Layers window should then look similar to that shown below. You are now ready to apply sharpening to the “Edge Sharpening” layer. As there is a layer mask attached to this layer, the sharpening will only appear in the areas where the layer mask is white and will be hidden from the black areas. Don’t forget that you can also change the Opacity of the sharpening layer to control the effect. Find out more about Photoshop Layers and Masks with my books.